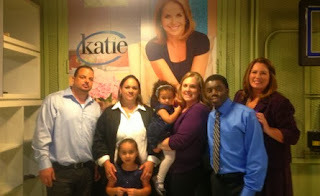 Backstage at The Katie Show! On September 18 several embryo donors and adopting families, their children, a Reproductive Endocrinologist and our own Marketing and Program Director, Kimberly Tyson were in New York City taping a segment on ‘The Katie Show’. We are thrilled that embryo donation and adoption are going to receive this kind of national exposure on Monday, September 30 when the show airs. Check your local listings for the time and ABC channel for your area or visit http://katiecouric.com/ to input your zip code and find out when to watch! The Embryo Adoption Awareness Center began working with a researcher from the show in late July to discuss the potential of doing a segment on this topic. Of course, they were interested in talking with families who had actually participated in embryo donation and adoption. The Center and the Snowflakes Embryo Adoption team began contacting our families to find a few who might be willing to participate in a media opportunity of this magnitude. We provided contact information for several families and the show made the final selections. Kelli and Dan Gassman [Gahzman], who adopted 11 embryos through a Snowflakes match and their 9-month-old embryo adopted son, Trevor. Dr. Robin Poe-Zeigler a Reproductive Endocrinologist with New Hope Center for Reproductive Medicine. Jodi and Larry Dillworth, a genetic family, and their daughter Bobbie. Rachel and Diony Victorin who adopted the Dillworth’s embryos through Embryo Adoption Services of Cedar Park and their daughter Esther. It was quite a crowd with a fantastic story to share!